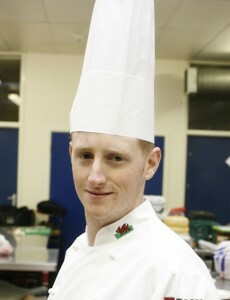 Chef Dion selected to compete for The Roux Scholarship | News by Wales Express News, People Before Profit! A leading Welsh chef has been selected as one of 18 regional finalists for The Roux Scholarship, one of the world’s most prestigious culinary competitions. It’s the second time that Dion Jones, 27, head chef at Crewe Hall Hotel, Crewe and originally from Valley, Anglesey, has been chosen for the competition. He last competed in 2013 when he was runner up and also appeared in popular TV series The Roux Scholarship televised on Watch to celebrate the 30th anniversary. In 2012, as UK champion, he became the first Welsh chef to win the prestigious International Escoffier Challenge Grand Final, the world’s oldest culinary competition, in the South of France, beating rivals from around the globe. He has also represented both the junior and senior Culinary Team Wales in the top international culinary competitions around the world. “I was very happy when informed that I had been selected for The Roux Scholarship this year, having been so close to winning in 2013,” said Dion, who is now perfecting a dish for the competition with advice from former Culinary Team Wales manager Graham Tinsley, executive head chef at Carden Park, near Chester. The Roux Scholarship offers the winner a career changing opportunity that is unrivalled and stretches far beyond the much coveted three month stage at a three Michelin starred restaurant followed by advice and guidance from the Roux family. The judges report that 2015 was a particularly strong year for entries with more than half of the finalists from restaurants outside London. Two regional finals will be held simultaneously on Thursday, March 12 at University College Birmingham and University of West London, Ealing. Dion competes in Birmingham alongside Harry Guy from L’Enclume, Cartmel, Tom Lawson from Rafters Restaurant, Sheffield, Richard Pascoe from The Feversham Arms Hotel, Helmsley, Ben Queen-Fryer from The Coach House Café and Bistro, Ulverston and Sam Rush from The Banningham Crown, Banningham. They will be out to impress judges Alain Roux, Angela Hartnett and Steve Love, Roux scholar in 1997. Six chefs will be selected from across the two regional finals to go through to the national final, which takes place at Westminster Kingsway College, London on Monday, March 30. The 2015 Roux Scholar will be announced at an awards ceremony held at The Mandarin Oriental, Hyde Park, London the same evening. This year’s challenge is to create a recipe to serve four people, using two whole guinea fowl, plus 200g trimmed chicken livers, served together, plated and accompanied by two garnishes. One garnish must include spinach leaves and the other to be a garnish of the chef’s choice. A sauce must accompany the dish. The chefs will have two and a half hours to cook their dish, along with a dessert from a mystery box of ingredients given to them on the day. The judges will be looking for those recipes and methods, which demonstrate the best balance of creativity, taste, style and practicality in the finished dish.